A Blackpool MP has slammed bank bosses over a ‘double-whammy’ of bank closures. Yorkshire Buillding Society has announced it is to shut it’s branch in Cleveleys. The move comes days after Yorkshire Bank announced the closure of its outlet in Cleveleys and HSBC revealed its Birley Street counters in Blackpool are to shut. The Gazette understand Lloyds has sent out also letters to customers at its Kirkham branch informing them it will close in April. The bank was unable to confirm its plans. Mr Maynard called on other bank bosses to commit to the high street and is urging those who have chosen to walk away to make a u-turn on their decisions. “I have written to the bosses at both banks expressing my disappointment and urging them to look at alternatives to full closure. “ I am also writing to the bosses of the other banks in Cleveleys asking them to commit to our high street for the foreseeable future. 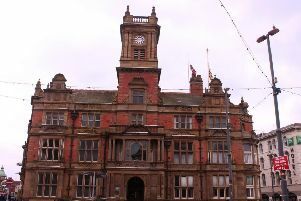 “Separately I will be speaking to Wyre Council to encourage them to think of innovative ways to ensure these former bank buildings become something other than another charity shop. “These bank closures further isolate local people, especially the older and more vulnerable. “One thing banks are citing for closure is the increase in on-line transactions.